Soft, chewy, fresh dates arrived in town and I had to make this gooey pie. The recipe comes from the book, Pie by Ken Haedrich, which is really a modern day pie bible. This beast-like book rivals a large dictionary in size and is over-flowing with nothing but pie recipes! The instructions are quite long and boring however, so I’ve rewritten them for impatient people like myself. I have discovered one really can live off pie. Just don’t tell my doctor! 1. In between sheets of wax paper, roll out the store bought pie crust to stretch it slightly and flatten it out evenly. Peel off the top paper and flip it upside down onto a 9 ½ inch Pyrex deep dish pie plate. Flute the edges. Pre-bake according to the box directions. 2. Next, pre-heat the oven (or turn the temperature down likely) to 350 degrees. 3. In a stand mixer beat the eggs and brown sugar on medium-high speed for 2 minutes. Add the melted butter and beat briefly. Add the corn syrup, vanilla, and salt and beat for 30 seconds. 4. Scatter the dates and nuts evenly over the pre-baked pie shell. Slowly pour the filling over them. Cover the edges with foil or a pie crust shield. 5. Bake the pie on the middle oven rack for about 45-50 minutes, or until the center seems set but may be slightly jiggly. 6. Move the pie to a wire rack to cool completely. Once cooled, cover loosely with aluminum foil and refrigerate for several hours until chilled. Serve with whipped cream or ice-cream as desired. Recipe from "Pie" by Ken Haedrich, with lots of bastardization by me, the impatient Laura Flowers. Yes, this is so speaking, no screaming, to me right now. Delicious! O!M!G! I LOVE dates and I LOVE pie. So guess what.... I LOVE this!!! I want it right now...bookmarked! You have another winner here. This is a bit like a pecan pie that sharing time and space with dates. I really like this one, Laura. More please. Beautiful pie. Perfect! I must try it. oh my oh my! delicious sounding and looking. This pie looks luscious, decadent and a wower! Dates everywhere, but they don't look as good as this! I have never cooked with dates, but I love Sticky Toffee Pudding so I am pretty sure I would love this pie. I love how diverse the items you make are. 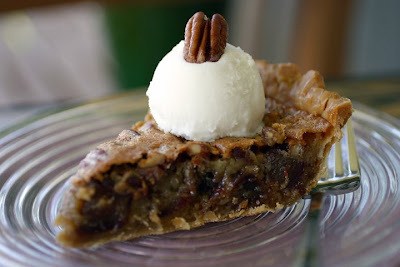 My husband adores dates; I have bookmarked this pie for him. I LOVE dates!!! This sounds so good!! Can you believe I have never try dates before?? I never had them back in my country and I have been afraid to try them here, but I can tell you this pie looks really good, specially with the ice cream on it. This sounds so amazingly good! What a great way to enjoy the Medjool dates!